Here’s how that came about. Her daughter, mother of the two grandchildren who might not have fit her personal definition of “grandchildren,” married outside of the grandmother’s religion. The two grandchildren were raised outside of that religion. The intermarriage so disturbed the grandmother than she equated that marriage to her daughter’s death and, consistent with the demands of her own religion, actually mourned her daughter’s death. 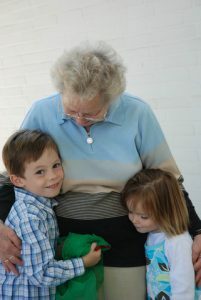 According to her two other children, this grandmother never accepted her daughter’s two children as grandchildren. They testified that when their mother spoke of her “grandchildren,” she meant only the four who were their children. There appears to have been no contact between the grandmother and her daughter for the first 16 years after the daughter’s marriage. An attempted reconciliation at that point was disastrous when the grandmother learned that her daughter’s children had been accepted into their new religion. There was other extrinsic evidence that the grandmother only counted four grandchildren. The attorney who drafted the trust stated that he understood that [the grandmother] did not count [her daughter’s] children among her grandchildren, nor even acknowledge their existence. He used the word “grandchildren” to include only [the two sons’] children. Although [one son and the grandmother’s husband] directed the attorney to draft the trust, the attorney said that he reviewed the trust with [the grandmother], explained that only [her two sons’] children would benefit, and she understood. Ruminations frequently writes about how courts will interpret our documents when their meaning is disputed. Generally, the rule is that courts will stay within the four corners of the document when the disputed language is held to be unambiguous. They won’t take testimony or look at other documents when the meaning of something in an agreement appears, on its face, to have only one meaning. When a court finds text to be ambiguous, i.e., capable of two (or more) meanings, it will look outside of the document in an effort to understand what the parties intended. That’s because “intent” is the keystone to interpretation. So, under those principles, if a lease or purchase agreement or loan document used the unqualified word, “grandchildren,” we would expect the dispute to be over the DNA results, not what the word “grandchildren” meant. Now, after seeing this court decision, we are a little less sure about the strength of the wall separating the analysis of unambiguous terms and the analysis of ambiguous terms. The court’s primary goal in interpreting a trust agreement is to fulfill the settlor’s intent. The Court has acknowledged that in ascertaining intent, its focus really is probable intent. When we say we are determining the testator’s intent, we mean his probable intent. With respect to interpretation, our courts have long disapproved the so-called “plain meaning rule,” which bars a court from looking beyond the face of a writing to consider extrinsic evidence in ascertaining intent. Evidence of the circumstances is always admissible in aid of the interpretation of an integrated agreement. This is so even when the contract on its face is free from ambiguity. In fairness, not all of that text is new to Ruminations or its readers. But the part saying “even when the contract on its face is free from ambiguity” is a splash in the face. [I]t does not matter whether an ambiguity was “latent” — that is, discernable only by resort to extrinsic evidence — or “patent” — identifiable on the face of the document. In deciding whether there is an ambiguity, a court should always admit extrinsic evidence including direct statements of intent since experience teaches that language is so poor an instrument for communication or expression. Extrinsic evidence shall be considered twice: to determine if there is ambiguity, and, if there is, to resolve it. So, there is really only one takeaway from today’s blog posting. Let’s all: “Write what we mean and mean what we write.” If we don’t, a court might do it for us. I find most troubling the courts pronouncement that “experience teaches that language is so poor an instrument for communication or expression” without even intimating a substitute. Adding insult to injury, the court proceeds to communicate its rationale with language. The lower court must be left asking if the appellate court really meant what it said.